I recently had the opportunity to sample a few upcoming blends from Casa Fernandez. First up is the extension for the company’s JFR (Just For Retailers) line – the JFR XT Corojo. This cigar is also available in Maduro, and is produced in three vitolas: 654 (6×54), 660 (6×60), and 770 (7×70). They will be packaged in boxes of 24 and retail between $7-$9 based on vitola. The Corojo version has AGANORSA Corojo (Nicaragua) wrapper, Nicaragua (AGANORSA) binder, and Nicaraguan filler. Today I’m covering the 6X54. The preliminary once-over shows a light to medium brown color, which is remarkably consistent. So much so that the seams are difficult to find. The soft press has also hidden the veins to a great degree. The complexion is incredibly silky smooth – yet with very little discernible oil to the touch. I found neither soft nor hard spots in any of the three examples. Two of my examples had very small (1/8”) voids in the wrap, between seams. This did not impact that smoking experience; I just thought it worth noting. The pre-light draw is slightly open, and provides solid oats, or grain flavor. Aroma is leathery and “clean.” Once fire is applied, the first puffs from the JFR XT were spectacularly filled with sweet cedar and a soft, almost creamy spice. This was likely due to the fact that it was largely composed of wrapper leaf from the closed foot. Lighting this closed foot was enough to carry forth and light the cigar itself. I’m always impressed when that occurs. The idea that 3-4 seconds with a torch can light a leaf that puts the entire foot of the cigar itself to fire serves multiple purposes. First, it makes lighting a breeze (and saves fuel for all you gas-misers out there). More importantly, to me, is the fact that this design gives the smoker an opportunity to sample the wrapper alone and get an idea of what it is specifically contributing to the cigar overall. The close foot has become one of my favorite features to see in a cigar. Once well into this first inch or so of cigar, the spice has ebbed slightly, but still has a peppery quality – think milder, white pepper moreso than flaming red pepper. The draw is within normal range, but maybe a bit more open than the “goldilocks zone.” Outside of this slightly open draw and a flaky ash, the construction is very good post-light. Passing the midpoint, the flavors have developed into a palette of sweet spices, cedar and leather. 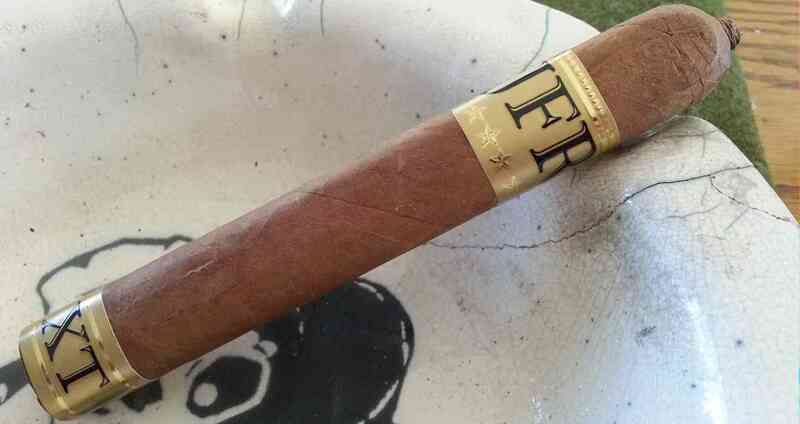 It seems Casa Fernandez’ cigars become more polished and blends more thought-out and developed with each passing day. The potency picks up some during the midsection, yet are still manageable for those of us with less tolerance. In all three samples smoked for this review, the middle of the JFR XT Corojo has been most attuned to my preferences in a smoke. The interplay between the sweet cedar and leather is delightful. In the final stretch, the strength has picked up a bit more – although in comparison to many other Casa Fernandez blends, this one is more medium in nature. The sweet spices remain, but are backed up by some earthiness that has crept in. This is just the transition needed to make the cigar complete. The cigar has performed very well, and leaves me with a sweet, pleasant finish.